Please contact the rescue before you buy a cage, very often cages sold are below the welfare standard. Minimum living space for a pair is 120cmx60cm on one level, runs or extra levels are a bonus but do not count towards the minimum required. I sometimes have indoor cages available to adopters that meet the rehoming size. I can also point you in the right direction for the correct sized new cages and hutches for the best price online (not petshop prices!). Available for adoption. Marlon & Tobias, 18 months old. Lively pair of boys, very strongly bonded. These boys love everything. Food, hay and each other. Marlon requires a bit of help with his boy bits, not a health issue just light maintenance. Available for adoption. Fleur & Flora 2,5 yrs old. Delightful girls with big characters. Sure to make you smile everyday. Available for adoption. Wilbur & Frazer, adult males. No age given for these two but they appear to be 18 months+. Fuzzy Frazer loves head scritches and chin rubs. Available for adoption. Torrens & Taggart 3 yrs old. Such a cute pair of boys. Happy lads and strongly bonded. Available for adoption. Willard & Maple, 18 months old. Sweet natured boys, would suit most families. REHOMED. Bailey & Jesmond 6 months and 4 months. These boys are a little shy but are learning quickly that cuddles are fun and come with extra treats too. REHOMED. Willow & Dolly. Mum Dolly is 9 months old and daughter Willow is 4-5 months old. RESERVED. Lord Snooty & Earl Grey, 3 yrs old. A darling pair of boys, bursting with cuteness and character. Best suited to an experienced home. REHOMED. Rafiki & Zazu. 1 yr old brothers that would blossom in a family given gentle handling and lots of treats. They will need a regular brush through, and possibly an occasional trim. Their hair is a bit of an unknown just yet as they've been badly barbered. 48 new piggies joined the rescue on 13th April taking the rescue to over 100 piggies. 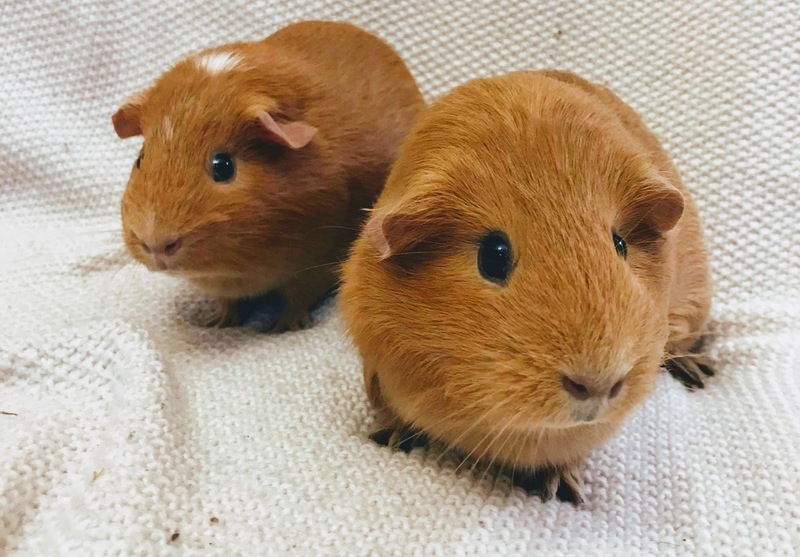 New homes for the guinea pigs ready for adoption are very much needed to clear space for the new piggies as they clear quarantine and pregnancy watch. REHOMED. Baby Mimi & Madeleine. Mimi was born here the rescue on 10th January. Mum Madeleine is approx 7-10 months old. Lively girls that will blossom in a family with gentle handling. REHOMED. Nia & Ness, 5-6 months old. The girls are hoping for a forever home, one with cuddles, treats and time to shine. REHOMED. Shae & Ros, 6 months old. A very happy, squeaky pair of girls. Would suit most families. REHOMED. Jaffa & Saladin 7 months and 4 months. Happy boys that will blossom in a family with lots of attention and treats. Baby Saladin is the 2500th piggy to arrive at the rescue! REHOMED. Caden & Tristan, 6 months. Brimming with character, the right family will bring these boys on quickly with gentle handling and treats. REHOMED. Persephone & Hebe are mother and daughter. Persephone is only 5 months, despite already being a mum. Her brothers were not separated from her early enough so she became pregnant at 4-6 weeks. Little Hebe was born here at the rescue on 20th January. Based in the Neath valley, South Wales UK. If you have a query please telephone or email as I cannot reply to comments. The rescue is not a centre that is open for public viewing, GGPR is run from my home, so all visits must be by appointment. The Glynneath Guinea Pig Rescue now has a facebook page. The life span is usually 5-7 years, but 8-9 years is not uncommon if given the right care and conditions. Summer housing - hutch and run. Hutch minimum 4 ft x 2 ft (120x60cm). Lidded run at least 4 ft long. Winter housing - indoors if possible otherwise in a well insulated heated shed. A garage is not suitable unless it has natural light, heat and is not used for a car! Special indoor cages are ideal, minimum of 120x60cm/48 inches. Currently zooplus.co.uk have good value indoor cages that meet the size required (Skyline Maxi XXL, Ferplast 120) also available Plaza 140 and Plaza 160. Temperature range - easy, if it's too hot/cold for you, it is for them. Ideal temp range is 15-25 degrees. Food - Around 80% of their diet should be hay. Guinea pigs MUST be fed guinea pig food, not rabbit food with vit C added. The vitamin, mineral and nutrition levels are very different and lifespan will be shortened. Please do not feed lettuce - it has very little nutritional value. Favourite veg are usually bell peppers, carrots, broccoli and cauliflower leaves. Portion size is a pingpong ball per type of veg (2-3 portions per day, can be 5 per day). All guinea pigs are rehomed as a non-breeding pair or trio, or as a companion to your lone guinea pig. I never rehome guinea pigs as companions to rabbits. No guinea pigs from this centre are to be used for breeding. If, for any reason, you cannot keep your guinea pigs I will welcome them back to the rescue. Set up in '03. Started because I felt guilty sitting on my backside watching animal rescue programmes feeling sorry for the animals and had the knowledge and experience to do something about it! So I got off the sofa and started organising. Had a shed built, constucted cages and runs, read and learnt as much as possible and let local rescues and vets know about me. The first guinea pigs arrived very soon and since then the rescue has grown every year.